Not to be confused with OS X Mountain Lion. A preview of Mac OS X 10.7 Lion was publicly shown at the "Back to the Mac" Apple Special Event on October 20, 2010. It brought many developments made in Apple's iOS, such as an easily navigable display of installed applications, to the Mac, and includes support for the Mac App Store, as introduced in Mac OS X Snow Leopard version 10.6.6. On February 24, 2011, the first developer's preview of Lion (11A390) was released to subscribers to the Apple Developer program. 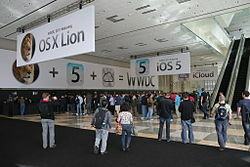 Other developer previews were subsequently released, with Lion Preview 4 (11A480b) being released at WWDC 2011. Lion was released to manufacturing on July 1, 2011, followed by its final release via the Mac App Store on July 20, 2011. Apple reported over one million Lion sales on the first day of its release. As of October 2011[update], Mac OS X Lion had sold over six million copies worldwide. Lion is the final release whose development was overseen by Bertrand Serlet, considered the "founding father of Mac OS X". On June 6, 2011, at the Apple Worldwide Developers Conference, it was announced that the official release for Lion would be in July 2011. The specific release date of July 20 was not confirmed until the day before, July 19, by Apple CFO, Peter Oppenheimer, as part of Apple's 2011 third-quarter earnings announcement. Apple did not initially announce any physical media distribution for Lion, such as a set of CD-ROMs or a DVD-ROM as used for past releases. Instead, the operating system was said to be available exclusively as a download from the Mac App Store for US$29.99. The only prior version of OS X that supports the Mac App Store is Snow Leopard, which implied that any machines that support Lion currently running Tiger or Leopard would first have to be upgraded to Snow Leopard, as opposed to allowing a direct upgrade to Lion. Apple later announced two alternative distribution mechanisms for the benefit of users without broadband Internet access: in-store downloads at retail Apple Stores, and a USB flash drive containing the OS, priced at US$69, available through the online Apple Store beginning in August. On August 4, 2011, Apple started to take orders for Mac OS X Lion's USB installation flash drives for $69.99. The Server portion of Lion is available as a separate download from the Mac App Store for US$49.99, which is in addition to the purchase price of Lion itself. In July 2012, Lion was removed from the Mac App Store and retail Apple stores following the release of OS X Mountain Lion. Following the removal of Lion from the Mac App Store, customers could still purchase Lion by phone at the reduced price of $20. In October 2013, Lion was returned to the Apple Store website concurrently with Mountain Lion following the release of OS X Mavericks for the convenience of users who cannot run Mavericks on older Mac models. Address Book uses an iPad-like user interface. It also includes improved Yahoo support and FaceTime calling. Apple Push Notification Service – Send over-the-air alerts, such as news updates or social networking status changes, using Apple's Push Notification service to applications that support APNS. APNS allows Mac OS X Lion and iOS clients to receive push changes to items such as mail, calendar and contacts from a configured OS X Lion Server. Auto-correction behaves much like on iOS devices, displaying an iOS-like popup box. Auto Save – As in iOS, documents in applications written to use Auto Save are saved automatically so users do not have to worry about manually managing their documents. The Auto Save feature significantly alters traditional workflow patterns and is a controversial addition to the system. Exposé in the Dock, a way of activating Exposé for a single application from the Dock, a feature added in Mac OS X 10.6, is altered. One must double-tap with two fingers on a dock icon to initiate single-application Exposé, or simply right-click or control-click and select Show All Windows. FaceTime comes bundled with Lion. FileVault offers full disk encryption and added security with XTS-AES 128 data encryption. Support for FileVault on external hard drives has also been added. Finder improvements – Finder search allows multiple search criteria to be specified without creating a smart folder, Finder search offers suggestions, files can be grouped by various attributes, and one can merge files under two folders with the same name – a prompt appears asking to replace or keep both files. The navigation sidebar lost the ability to show the specific icon of a map[vague] or volume (by default; there is a hack to still add the old ability), instead it shows a grey standard map icon. Font Book 3 – Font Book 3 provides more flexible displays of character glyphs supplied by a particular font face. Duplicate font files are flagged with a warning icon, and can be fixed automatically or resolved manually. Full-screen apps – Native, system-wide support for full-screen applications running in their own space. Supporting applications display a new button at the top right of application window, this button opens applications in full-screen mode. However, full screen mode is not supported for dual screen setups. iChat has support for logging into Yahoo! Messenger. Users can audio- and video-chat with other iChat users using their Yahoo! accounts. Languages/Localization – Arabic, Czech, Turkish and Hungarian are added as full system languages, to make the total number of twenty-two languages available in Mac OS X.
Mac App Store – An application store built in the image of the iOS App Store. Like in iOS, it provides ways for shoppers to discover apps, one-click installation of apps, and one-click updates of all or selected installed applications. Despite being announced as a future feature of Lion, the Mac App Store was released for Mac OS X Snow Leopard on January 6, 2011, as it was bundled with the Mac OS X 10.6.6 update. Mail 5 – Uses an iPad-like user interface, has a fullscreen-optimized view, uses chronological "Conversations" to organize messages, and supports Exchange 2010 (but not through the Exchange ActiveSync protocol, as iOS). Mission Control replaces the "All windows" Exposé feature. It gives an overview of all running applications just like "All windows" but groups windows from the same application. At the top of the screen it gives quick access to the Dashboard, Spaces, and running full-screen applications. Multi-touch gestures – Similar to iOS, additional gestures performed using a multi-touch input device (e.g. Magic Mouse, Magic Trackpad) allow the user to scroll, swipe to different pages, and enter Mission Control. While this is not the first official multi-touch support for Mac OS X, it has been expanded; other frameworks, such as Lux, have already created multi-touch support. Multi-User Screen Sharing – The built-in Screen Sharing feature allows remote users to log into a separate user account from the one that is currently logged in. While one user is logged into a machine, a second user can log into the same machine remotely, seeing their own desktop and user environment. Profile Manager provides several features, including push notification-based management of OS X Lion and above. QuickTime reincorporates some features from QuickTime Pro. New features cited include Copy/Paste, Insert Clip, Crop Video, Rotate Video, Resize, Trim, and more Export options. Recovery Partition – Apple has introduced a recovery partition that includes utilities generally found on the OS X discs. This partition permits the user to restore their computer to its original factory state. If the partition were to become damaged or otherwise not available, such as with a new drive, a new copy of OS X Lion can be installed over the internet. Resume – Applications resume in the same state when re-opened as already seen in iOS. Safari – With full-screen mode and the new WebKit2 layout engine. System Information – This feature is a re-design of System Profiler, which has been completely altered with new views which display graphical information on displays, storage devices, memory usage along with other hardware information. The previous layout remains available by clicking "System Report". Early builds of Lion also used System Information as a replacement for "About This Mac", although the final release reinstated the version of this dialog box found in Snow Leopard. Vertical text – Lion supports vertical layouts for East Asian languages. The complete list was on Apple's website but has since been taken down; it can now be found on the Internet Archive. The developer release notes may also be of interest. Wiki Server 3 – Making it easier to collaborate, share, and exchange information. Users can quickly switch between a server's home page, My Page, Updates, Wikis, People, and Podcasts. File sharing is simpler, and a new Page Editor is added for easy customization. WebDAV File Sharing – Lion Server delivers wireless file sharing for clients that support WebDAV. Enabling WebDAV in Lion Server gives iOS users the ability to access, copy, and share documents on the server from applications such as Keynote, Numbers, and Pages. Profile Manager – Profile Manager delivers simple, profile-based setup and management for Mac OS X Lion, iPhone, iPad, and iPod touch devices. It also integrates with existing directory services and delivers automatic over-the-air profile updates using the Apple Push Notification service. Redesigned Aqua user interface elements, including buttons and progress bars. The red, yellow, and green buttons in the window decorations have also been made smaller, with a slightly changed design. Flexible window resizing from any corner or edge of the window, similar to window resizing in Microsoft Windows and many window managers for X11. The metal finish has also been slightly altered. It is a lighter shade of grey and features a speckled texture. Scrollbar arrows have been removed. Scrolling is reversed by default, to act more like a touch screen device, so that content moves in the direction of finger movement on touch-pad or mouse (with the scrollbar moving in the opposite direction), rather than the scrollbar moving in the direction of finger movement (with the content moving in the opposite direction). Also, like in iOS, scrolling "bounces" when the scroll bar hits the top or bottom of the window. When resizing a window by clicking on the green button (left-top), a transform effect animates the enlargement. New windows fly to the front (like opening an app in iOS). The dashboard is its own space in Mission Control, rather than in previous versions of OS X where the widgets simply flew in and the background dimmed. The "ripple effect" that was seen previously when adding widgets is no longer there due to this change. Users have the option to return to the old dashboard configuration in System Preferences. Tabs, when selected, have a recessed and darkened appearance as opposed to previous versions where selected tabs were highlighted in aqua blue. Save As – replaced by Duplicate and Revert functions due to the introduction of Auto Save and Versions (only applies to applications modified to support Auto Save, such as TextEdit; applications not modified to support Auto Save, such as Microsoft Word, retain this functionality). Front Row, a media center application. The application has been copied into Lion by third-party users, however its incompatibility with iTunes 10.4 renders some features useless. Rosetta, software that makes possible the execution of PowerPC software on x86 hardware, is no longer available. This disables some programs that ran on previous versions of Mac OS X. Programs requiring Rosetta to operate are not allowed to be distributed via the Mac App Store. Adobe Flash Player and Apple's Java Runtime Environment (JRE) are not included in new installations of Lion, but both can still be downloaded and installed manually. Apple is no longer actively maintaining its JRE, but Software Update offers to download Snow Leopard's JRE when a user tries to run a Java program and the JRE is not installed. Programs using Java are not allowed to be distributed via the Mac App Store. iSync, software used for syncing contacts and calendars to third-party mobile phones, is no longer included; however, iSync v3.1.2 from Snow Leopard continues to work. Remote Install Mac OS X, software that allows OS X to be installed using the Remote Disk feature. Using Target Disk Mode, users can circumvent this omission. This is replaced by the Recovery Partition, which does exactly the same thing but without needing an external disk, as long as the hard disk is not damaged. Apple USB Modem is not compatible with Lion. QuickTime Streaming Server, software used to deliver video and audio on request to users over a computer network, including the Internet. WPA Enterprise configuration for wireless networks was replaced by the requirement to obtain a configuration profile. Reception for OS X Lion has been mixed; complaints include a substantial backlash by "Pro" users with workflows affected by the Autosave/Revert workflow. Other highly criticized decisions include the change to "natural scrolling", hiding of the scroll bar, the omission of the iSync program necessary to synchronize a Mac with non-Apple mobile devices, as well as abandoned functionality in Exposé and Spaces. However, in an extensive review of the operating system, Ars Technica recommended Lion. They noted that it feels like it is the start of a new line of operating systems that will continue to be influenced by Apple's iOS platform. The review also compared the introduction of Lion, along with its new conventions that change traditional ways of computing, with the original Mac OS X and when it replaced the classic Mac OS. Macworld called Lion a "radical revision", praising the changes made to the operating system to be more user friendly to new Mac users who are familiar with the iOS interface, while criticizing the limited utility of the interface. Ultimately, the magazine considered Lion an operating system worth getting, giving it 4.5 out of 5 stars. guardian.co.uk called Lion a substantial improvement from its predecessors and considered it a "steal" given its price. On the other hand, Gizmodo stated that the new interface "feels like a failure" and concluded by saying that "it doesn't feel like a must-have upgrade". Ted Landau of MacObserver also had serious criticism of Lion, reversing his earlier praise of Autosave and writing, "Auto Save takes irritatingly long when working with large documents. Still others lament the loss of the Save As… command, noting that the new Duplicate option is not as convenient to use. The consensus is that none of this would matter much — if you could disable Auto Save. If you like how it works, leave things as is. Otherwise, get rid of it. But Lion offers no way to turn Auto Save off. This is the heart of the "my way or the highway" complaint. A posting sums it up: "The new features are intrusive, non-respectful of the users' choices, and cannot be changed." Due to Lion's enhanced security features, including application sandboxing, Dino Dai Zovi, principal of security consultancy Trail of Bits and the coauthor (with Charles Miller) of The Mac Hacker's Handbook, characterized Lion's security as "a significant improvement, and the best way that I've described the level of security in Lion is that it's Windows 7, plus, plus. I generally tell Mac users that if they care about security, they should upgrade to Lion sooner rather than later, and the same goes for Windows users, too." Applications depending on Rosetta, such as Office for Mac 2004, AppleWorks, and early versions of Quicken for Mac 2007, are no longer supported. This affects applications listed as Classic or PowerPC in System Profiler. Unix package managers for Mac OS X such as Fink and MacPorts require reinstalling and then running Xcode. ^ "Apple technology brief on UNIX" (PDF). Apple. Retrieved November 5, 2008. ^ "Mac OS X Lion Available Today From the Mac App Store" (Press release). Apple Inc. July 20, 2011. ^ "Mac OS X Lion Update 10.7.5 (Client)". ^ "Apple security updates". Apple. October 21, 2015. Retrieved November 3, 2015. ^ "Mac OS X Lion Available Today From the Mac App Store". Apple Inc. Retrieved July 20, 2011. Apple today announced that Mac OS X 10.7 Lion [...] is available today as a download from the Mac App Store for $29.99. ^ "Mac OS X 10.7 Lion – The world's most advanced desktop operating system". Archived from the original on July 29, 2011. Retrieved June 11, 2011. ^ Graham, Jefferson (October 21, 2010). "New Apple MacBook Air costs less, plus App Store is coming". USA Today. ^ a b c "Apple unveils new MacBook Airs, previews Lion". CNET. Retrieved October 22, 2010. ^ Ex (February 25, 2011). "Apple Seeds First Mac OS X 10.7 Lion Build 11A390". iPhoneinCanada.ca. Retrieved June 7, 2011. ^ "Apple devs get iTunes 10.5 beta, Apple TV 2 beta, Xcode 4.2 Preview and Lion Preview 4". AppleInsider. Retrieved June 7, 2011. ^ "OS X Lion Golden Master seeded to developers ahead of July launch". Retrieved July 1, 2011. ^ "Apple's Lion roars onto computers with 1 million downloads in a day". The Independent. UK. July 22, 2011. Retrieved July 22, 2011. ^ Tim Cook (October 4, 2011). "Apple Special Events October 2011". Apple Inc.
^ "Craig Federighi: Top 10 Facts You Need to Know". heavy.com. UK. June 12, 2013. Retrieved August 8, 2018. ^ a b "OS X Lion – Get Lion in July. Only from the Mac App Store". Apple Inc. Archived from the original on June 23, 2011. Retrieved June 7, 2011. ^ a b "Mac OS X Lion Set for July Debut Priced at $29.99, Mac App Store Exclusive". MacRumors. Retrieved June 7, 2011. ^ Apple (July 20, 2011). "Mac OS X Lion Available Today From the Mac App Store". Retrieved July 20, 2011. ^ Faheem Saeed (August 5, 2011). "Mac OSX Lion USB Stick Is Available Now For $69.99". Howtoarena.com. Archived from the original on January 18, 2012. Retrieved February 1, 2012. ^ a b c d "Lion Server – The server for everyone". MacUpdate LLC. Archived from the original on February 2, 2014. Retrieved January 20, 2014. ^ "Apple OS X Lion pulled as Mountain Lion rolls out". AppleInsider. July 25, 2012. Retrieved July 27, 2012. ^ "Mac OS X 10.7 Lion is still available for purchase from Apple". Tuaw. January 24, 2013. Retrieved October 31, 2013. ^ "Apple.com Now Selling $20 OS X Mountain Lion And Lion Redemption Codes For Older Macs". TechCrunch. October 24, 2013. Retrieved October 31, 2013. ^ "Enable TRIM for All SSD's in Mac OS X Lion". ^ "Mac OS X Lion Roundup: Recovery Partitions, TRIM Support, Core 2 Duo Minimum, Focus on Security". MacRumors. February 25, 2011. Retrieved June 7, 2011. ^ a b c d "Apple – OS X Lion – Technical specifications". Apple Inc. Archived from the original on August 19, 2011. Retrieved August 15, 2011. ^ "AirDrop". The Graphic Mac. Retrieved March 18, 2011. ^ "AirDrop". Apple Inc. Archived from the original on January 4, 2012. Retrieved August 26, 2014. ^ "Security". Apple Inc. Archived from the original on January 4, 2012. Retrieved August 26, 2014. ^ "Apple Developer - What's New in Lion". Apple Inc. Retrieved August 25, 2011. ^ a b c "Text". Apple Inc. Archived from the original on January 4, 2012. Retrieved August 26, 2014. ^ a b "Auto Save and Versions – Every edit, every rewrite. Saved". Apple Inc. Archived from the original on January 4, 2012. Retrieved April 8, 2018. ^ "OS X Lion: About Auto Save and Versions". Apple Inc. Retrieved April 8, 2018. ^ a b "Inside Mac OS X 10.7 Lion: Font Book 3, Emoji support". AppleInsider. February 27, 2011. Retrieved June 7, 2011. ^ "What is Mac OS X? – Exposé". Apple Inc. Archived from the original on December 1, 2010. Retrieved December 6, 2010. ^ "FileVault 2". Apple Inc. Archived from the original on January 4, 2012. Retrieved August 26, 2014. ^ "Finder". Apple Inc. Archived from the original on January 4, 2012. Retrieved August 26, 2014. ^ "Inside Mac OS X 10.7 Lion: New Finder search, item arrangement views". AppleInsider. February 27, 2011. Retrieved February 27, 2011. ^ "Full-Screen Apps – Work and play without distractions". Apple Inc. Retrieved June 6, 2011. ^ "Accessibility". Apple Inc. Archived from the original on January 4, 2012. Retrieved August 26, 2014. ^ "Inside Mac OS X 10.7 Lion: Dozens of new high quality multilingual speech voices". AppleInsider. March 2, 2011. Retrieved June 7, 2011. ^ "iCal". Apple Inc. Archived from the original on January 4, 2012. Retrieved August 26, 2014. ^ "Mac OS X 10.7 Lion: iCal 4.0 gets annual view, iPad appearance". April 1, 2011. Retrieved June 6, 2011. ^ "iChat". Apple Inc. Archived from the original on January 4, 2012. Retrieved August 26, 2014. ^ "More Lion features: iChat does Yahoo! IM, does iOS key menus, Live Preview". 9 to 5 Mac. Retrieved June 6, 2011. ^ "System – New system languages". Apple Inc. Archived from the original on January 4, 2012. Retrieved August 26, 2014. ^ "Launchpad – Instant access to all your apps". Apple Inc. Retrieved June 6, 2011. ^ "App Store – Buy, download, and install apps made for Mac". Apple Inc. Archived from the original on June 8, 2011. Retrieved June 7, 2011. ^ AppleInsider Staff (October 20, 2010). "Apple's new Mac App Store coming to Snow Leopard within 90 days". AppleInsider. Retrieved October 24, 2010. ^ "Mac OS X v10.6.6 Update". Apple Inc. Retrieved February 24, 2011. ^ "Mail – The smartest email app you'll ever use". Apple Inc. Archived from the original on January 4, 2012. Retrieved August 26, 2014. ^ "Mail". Apple Inc. Archived from the original on January 4, 2012. Retrieved August 26, 2014. ^ "Mission Control – A bird's eye view of everything". Apple Inc. Retrieved June 6, 2011. ^ "Multi-Touch Gestures – More natural control of your Mac". Apple Inc. Retrieved June 6, 2011. ^ "Full-Screen Multitouch Mac OS X Is Here (But Not from Apple)". Gizmodo. Retrieved January 23, 2011. ^ "Screen Sharing". Apple Inc. Archived from the original on January 4, 2012. Retrieved August 26, 2014. ^ "Mac OS X 10.7 Lion to introduce multi-user Screen Sharing". AppleInsider. March 31, 2011. Retrieved June 7, 2011. ^ "Preview". Apple Inc. Archived from the original on January 4, 2012. Retrieved August 26, 2014. ^ a b Arnold Kim (February 27, 2011). "Mac OS X Lion: Drops PowerPC Emulation, Adds QuickTime Pro Features, Much More". MacRumors. Retrieved February 27, 2011. ^ Charles Edge (February 27, 2012). "Configuring & Using Profile Manager 2 in OS X Mountain Lion Server". Krypted.com. Retrieved April 27, 2013. ^ "Lion Recovery". Apple Inc. Archived from the original on January 4, 2012. Retrieved August 26, 2014. ^ Martin, David W. (February 25, 2011). "Mac OS X Lion Adds Recovery Partition Support [Gallery". Cult of Mac. Retrieved June 7, 2011. ^ "Resume". Apple Inc. Archived from the original on January 4, 2012. Retrieved August 26, 2014. ^ "Safari". Apple Inc. Archived from the original on January 4, 2012. Retrieved August 26, 2014. ^ "WebKit2 Coming To OS X Lion, iOS 5 Could Be Next". Apple Gazette. February 27, 2011. Retrieved June 7, 2011. ^ "Inside Mac OS X 10.7 Lion: new iOS-like About this Mac app". AppleInsider. February 26, 2011. Retrieved June 7, 2011. ^ "TextEdit". Apple Inc. Archived from the original on January 4, 2012. Retrieved August 26, 2014. ^ a b "Inside Mac OS X 10.7 Lion: TextEdit adds vertical layout, graphical toolbar". Retrieved June 6, 2011. ^ "OS X Lion – Over 250 new features. Read about all of them (via Internet Archive)". Apple Inc. Archived from the original on June 23, 2011. Retrieved June 21, 2011. ^ "What's New in OS X: OS X Lion v10.7". Apple, Inc. Retrieved 19 December 2014. ^ Finley, Klint (February 24, 2011). "Is OSX Lion Server More Evidence That Apple is Gunning for the Enterprise?". ReadWrite. Retrieved June 7, 2011. ^ a b c d Siracusa, John (July 20, 2011). 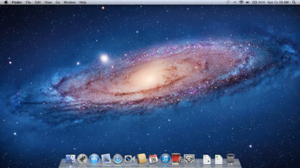 "Mac OS X 10.7 Lion: the Ars Technica review". Ars Technica. ^ "Other Features". Apple Inc. Archived from the original on January 4, 2012. Retrieved August 26, 2014. ^ "Inside Mac OS X 10.7 Lion: New window controls & gestures". AppleInsider. February 25, 2011. Retrieved June 7, 2011. ^ "Workaround for Having No Scrollbar Arrows in Mac OS X Lion". osxdaily.com. December 9, 2011. Retrieved December 13, 2012. ^ "System Preferences". Apple Inc. Archived from the original on June 9, 2011. Retrieved June 10, 2011. ^ Siracusa, John (July 20, 2011). "Mac OS X 10.7 Lion: the Ars Technica review". Ars Technica. Retrieved February 1, 2012. ^ "Inside Mac OS X 10.7 Lion: Developer Preview 3 dials down animated tabs". AppleInsider. April 29, 2011. Retrieved July 12, 2011. ^ a b c "Mac OS X Lion drops Front Row, Java runtime, Rosetta". AppleInsider. February 26, 2011. Retrieved February 27, 2011. ^ Mark Gurman (July 19, 2011). "OS X Lion kills Front Row… here's how to get it back!". 9 to 5 Mac. Retrieved October 7, 2011. ^ Mackenzie, Iain (August 11, 2011). "When to pull the plug on old software". BBC News Online. Retrieved February 1, 2012. ^ a b Metz, Cade (February 27, 2011). "Apple vanishes Java from Mac OS X Lion". The Register. U.K. Retrieved February 1, 2012. ^ "MacBook Air: all substance, no Flash". Engadget. October 20, 2010. Retrieved February 1, 2012. ^ "Apple Is No Longer Bundling Flash Player With Mac OS X". Daring Fireball. October 22, 2010. Retrieved February 1, 2012. ^ Kessler, Topher. "Java for OS X Lion available from Apple". CNET. Retrieved July 25, 2011. ^ Gruman, Galen (2011-08-23). Mac OS X Lion Bible. John Wiley & Sons. ISBN 9781118023761. ^ "Reinstalling software using Remote Install Mac OS X v10.5 and v10.6". Apple Inc. Retrieved August 3, 2011. ^ David W. Martin (August 15, 2011). "Mac OS X Lion Says Good-Bye To Analog Communications [Modems]". Cult of Mac. Retrieved August 16, 2011. ^ Eric Geier (October 7, 2011). "Configuring 802.1X in Mac OS X Lion and Later". Retrieved August 4, 2012. ^ a b Ted Landau. "Discontent with Lion's "My Way or the Highway" Approach". The Mac Observer. Retrieved February 1, 2012. ^ Ellis Hamburger (July 21, 2011). "Here's Why Mac OS X Lion's "Natural Scrolling" Feels So Horribly Unnatural". Business Insider. ^ Anupam Sengupta. "The missing iSync in OS X Lion". ^ Julian Saraceni. "My take on Application Exposé in Lion". ^ Seth (July 26, 2011). "How To Fix Everything That's Wrong With Lion - Part Five". Archived from the original on June 30, 2012. ^ Snell, Jason (July 20, 2011). "Apple OS X Lion". Macworld. Retrieved July 21, 2011. ^ Gemmell, Matt (July 20, 2011). "Mac OS X Lion: in-depth review with pictures". The Guardian. UK. Retrieved July 21, 2011. ^ Diaz, Jesus (July 11, 2011). "Mac OS X Lion: This Is Not the Future We Were Hoping For". Gizmodo. Retrieved July 24, 2011. ^ Goodin, Dan (July 21, 2011). "Major overhaul makes OS X Lion king of security". The Register. Retrieved July 23, 2011. ^ "Known issues with Office for Mac on Mac OS 10.7 (Lion)". Microsoft. July 23, 2011. Retrieved February 1, 2012. ^ Breen, Christopher. "Last call for AppleWorks users". Macworld. Retrieved May 19, 2013. ^ Breen, Christopher. "Lion and the Rosetta dead-end". Macworld. Retrieved February 1, 2012. ^ . "Plans for Lion". Comments.gmane.org. Retrieved February 1, 2012. ^ "Migrating a MacPorts install to a new major OS version or CPU architecture". Trac.macports.org. Retrieved February 1, 2012. ^ "Mac OS X: About This Mac "build" information". Apple Inc. April 14, 2010. Retrieved April 26, 2010. ^ "OS X Lion USB Thumb Drive - Apple Store (U.S.)". Apple Inc. Archived from the original on January 12, 2012. Retrieved February 1, 2012. ^ "Lion build number Bingo: 11A511 vs. 11A2061 vs. 11A2063". ZDNet. July 29, 2011. Retrieved February 1, 2012. ^ "OS X Lion: About Lion Recovery". Apple Inc. January 5, 2012. Retrieved February 1, 2012.